IFTN caught up with director Tim Wardle and Irish editor Michael Harte of the hugely successful documentary ‘Three Identical Strangers’, which releases in Ireland - Friday, November 30th. 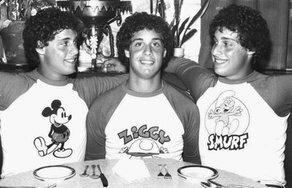 ‘Three Identical Strangers’ tells the incredible story of Eddie, David and Robert, three young men who connected in New York in 1980 having discovered that they were triplets who were separated at birth. Having all been adopted, the documentary follows the story of their reunion and the truth behind why their paths were split in the first place. From British production company RAW Productions, the documentary was an official selection of Sundance Film Festival in January of 2018 where it picked up the Special Jury Prize. Since then it has taken in $12.5M at the U.S box office and has been hailed as one of the most successful British feature documentaries of all time. Tim Wardle is a BAFTA-nominated documentary filmmaker, and Executive Producer at Raw Productions. He has also worked as head of development for a number of leading UK production companies, including Century Films, Blast Films, Raw and BBC Documentaries. Irish editor Michael Harte began his career on RTE’s ‘The Savage Eye’ and has gone on to edit on television projects such as ‘The Undateables’. Wardle and Harte worked together on the television movie ‘One Killer Punch’; however ‘Three Identical Strangers’ marks their debut in feature film-making. IFTN journalist Nathan Griffin caught up with Wardle and Harte to discuss the documentary and its success so far. IFTN: How and when did you first hear about this story? IFTN: At what point did you and your production actually come into the frame in aiding the triplets in their search for answers? IFTN: How did you get involved with this project? IFTN: As you said, it's an incredible subject matter and I can only imagine that there were so many ways you could have told the story and so many avenues you could have explored. Can you give me some insight into the preparation you had beforehand, and how that influenced your decision as to how to approach the actual documentary itself? IFTN: How crucial a role did this preparation and approach play in helping you get this story across on screen? IFTN: In the film you allude to the fact that there were a number of powerful people that didn’t necessarily want this story to come out. What sort of obstacles, if any, did you have to overcome in that capacity? IFTN: Do you think that the fact that you were a British production actually aided you in that you could avoid being lobbied in a sense, like some of the preceding American companies might have done? IFTN: You talked about sources. In relation to the interviews that you conducted in the documentary, as a director, how did you approach speaking with those external sources that were involved in the actual study? Then also, how did you approach conveying your findings to the brothers? IFTN: One key thing that stands out in the documentary is the pacing of the film. I would compare it almost to a thriller, in the sense that you have no idea where the next twist is coming; keeping you on the edge of your seat. IFTN: Can you talk me through the editing process and how you were able to achieve this? IFTN: I can only imagine that there was a lot of old material to go back over, which you utilise in the film to convey some of the twists. IFTN: So is it fair to say that since the decision was made to taking on this story, the project’s journey has seen it elevate to a level that you never envisaged? ‘Three Identical Strangers’ releases in Ireland at the IFI on Friday, November 30th.